Neal Jones was born in 1938 in Baton Rouge, Louisiana. He was commissioned a 2d Lt in the U.S. Air Force through the Air Force ROTC program at Tulane University on May 30, 1960, and went on active duty beginning June 25, 1960. 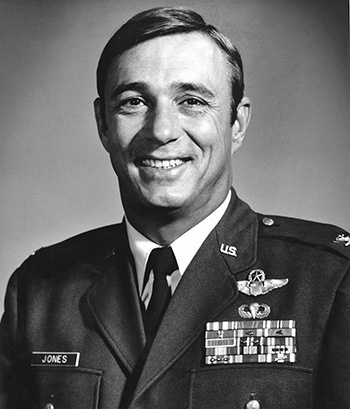 Lt Jones next completed pilot training and was awarded his pilot wings at Reese AFB, Texas, in August 1961, followed by F-100 Super Sabre Combat Crew Training from August 1961 to July 1962. His first assignment was as an F-100 pilot with the 612th Tactical Fighter Squadron at England AFB, Louisiana, from July 1962 to December 1963, and then as an F-105 Thunderchief pilot with the 80th Tactical Fighter Squadron at Itazuke AB and then Yokota AB, Japan, from December 1963 until he was forced to eject over North Vietnam and was taken as a Prisoner of War on June 29, 1966. After spending 2,421 days in captivity, Maj Jones was released during Operation Homecoming on February 12, 1973. He was briefly hospitalized to recover from his injuries at Keesler AFB, Mississippi, and then attended the Armed Forces Staff College at Norfolk, Virginia, from August 1973 to March 1974. Col Jones' next assignment was as an A-7 Corsair II pilot, Chief of Operations Training, and then as Commander of the 357th Tactical Fighter Training Squadron of the 355th Tactical Fighter Wing at Davis-Monthan AFB, Arizona, and then as Chief of the Inspection and Evaluation Group with Headquarters Tactical Training at Davis-Monthan from April 1974 to June 1978. 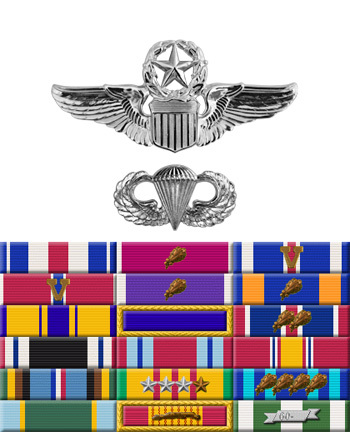 He then attended Air War College at Maxwell AFB, Alabama, from July 1978 to June 1979, followed by duty with the Directorate of Plans, Deputy Chief of Staff/Plans and Operations, with Headquarters U.S. Air Force in the Pentagon from June 1979 until his retirement from the Air Force on December 31, 1981. Col Jones first flew combat missions in Southeast Asia in November and December 1964 while on temporary duty from Japan, and then again from June to August 1965, in December 1965, in January 1966, in May 1966, and in June 1966 when he was shot down. On 1 July 1966: This officer distinguished himself by gallantry and intrepidity in action in connection with military operations against an opposing armed force while a Prisoner of War in North Vietnam. Ignoring international agreements on treatment of prisoners of war, the enemy resorted to mental and physical cruelties to obtain information, confessions and propaganda materials. This American resisted their demands by calling upon his deepest inner strengths in a manner which reflected his devotion to duty and great credit upon himself and the United States Air Force.